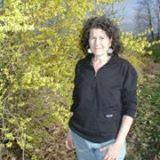 Linda lives in rural western Massachusetts in the small town of Shelburne Falls. She is one of the co-founders of Ultimate Peace along with David Barkan and Dori Yaniv. As an unpaid volunteer she devotes her time and energy all year to Ultimate Peace as the organization’s COO. She is also the Director of Operations and oversees “Measurements and Evaluations” of the Ultimate Peace Summer Camp program. Linda’s initial involvement in the sport of Ultimate was not as a player but, rather as an Ultimate player’s parent. Linda has dedicated many years to growing and promoting youth Ultimate in the United States. She and her husband ran a high school program for 10 years, developing and establishing their program as one of the first varsity Ultimate teams in the country. While at Northfield Mount Hermon, they founded the New England Prep School Ultimate League (NEPSUL), a private high school league in New England, and worked hard to establish Ultimate as a recognized competitive sport. In 2006 Linda organized and ran the World Flying Disc Federation’s (WFDF) Junior Ultimate Championships for 16 youth teams throughout the world to compete in a USA venue. It was through this project that she met David and Dori. Together they made it possible for an Israeli youth team to travel to the USA to participate. Linda also worked tirelessly to allow the youth team from Columbia, who did not have sufficient support or resources on their own, to attend the event. Linda’s past work includes: 13 years of board leadership for the Northeast Foundation for Children and The Greenfield Center School, a national education reform organization and K-8 laboratory school who developed “The Responsive Classroom”. She served as President of the Berkshire East Ski Team Association and Race Director for the Massachusetts Intercollegiate Athletic Association (MIAA) States competition; Co-House Director at the Northfield Mount Hermon School, a New England preparatory high school with a 25% international community, and, was a childbirth educator on the Hopi Indian Reservation in northern Arizona, where she attended several births, supporting both Navaho and Hopi women and their families through childbirth in the community Indian Health Services facilities. When Linda is not working full time with UP she is traveling throughout western Mass. assisting her husband, Robert, in their mobile veterinary practice. Although at home surrounded by open fields and the wooded landscape of western Massachusetts with their dog (Habibi), cat (Tim) and fostered turtle (Lucas), Linda and her husband are very connected to the urban lives of their two sons: Tivon and his wife Katie in San Francisco and Misha in Boston.